This artist's illustration shows the close proximity of two Saturn-size alien planets in the Kepler-9 solar system. Scientists now say that two close exoplanets could potentially share life between them. Alien planets that are close neighbors to each other around the same parent star could help each other support life, creating what scientists are now calling "multihabitable systems." In the past 25 years, astronomers have confirmed the existence of more than 1,900 exoplanets, or alien planets around other stars. Past research suggested that billions of exoplanets are potentially habitable in the Milky Way — that is, they lie in the habitable zones of their parent stars, where temperatures are right for liquid water to exist, and thus life as it is known on Earth. An astronomical unit (AU) is the average distance between the sun and Earth, about 93 million miles (150 million kilometers). At best, Mars and Earth are about one-half of an AU apart, or 200 times the distance between Earth and the moon. 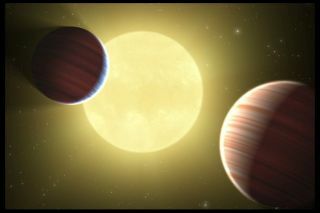 This artist's illustration shows a so-called "planetrise" between exoplanets Kepler-36b and Kepler-36c, which orbit the star Kepler-36 about 1,200 light-years away. The discovery of Kepler-36's two planets raises the possibility of multihabitable systems with two or more Earth-sized planets orbiting near each other in the habitable zones of their stars. To see what life might be like on such worlds, the scientists ran a series of computer models simulating multihabitable systems. The researchers discovered that climates might be stable on planets in multihabitable systems. The seasons and climate on Earth depend on its obliquity, or the 23.5-degree tilt of the Earth's axis relative to its orbit around the sun — for instance, at Earth's poles, the lengths of days and nights change drastically over the course of the year, but at the equator, they stay about the same over time. A change in obliquity of only a few degrees can set off ice ages, but the scientists found that it was unlikely that gravitational interactions between planets on closely neighboring orbits would trigger large changes in the obliquities of the orbits of those worlds. "We found that the obliquities of the planets in multihabitable systems were not really affected by their close orbits," study co-author Gongjie Li at the Harvard Smithsonian Center for Astrophysics in Cambridge, Mass., said in a statement. "Only in rare instances would their climates be altered in dramatic ways. Otherwise, their behavior was similar to the planets in the solar system." The scientists also found that each planet in this scenario could be capable of seeding its partner with life. Cosmic impacts regularly blast debris off planets that can crash on nearby planets — for example, past research discovered more than 100 meteorites of Martian origin on Earth. In principle, such meteorites could bring life-bearing material from one world to another, a process called lithopanspermia. It remains uncertain whether lithopanspermia was possible between Mars and Earth. The great distance between the planets means it would take a lot of time for meteorites to bridge the gap between the worlds, making it less likely for any hitchhikers to survive. Powerful impacts are also needed to hurl meteorites across such a vast distance, and the energy from such collisions might easily kill any potential stowaways. However, since planets in multihabitable systems are much closer to each other than Mars and Earth are, microbes are more likely to both survive the impacts that launch them into space and the long times they would spend traversing interplanetary space. The researchers even suggested that possessing a habitable companion might help life survive on distant exoplanets. "The climate isn't likely to be any worse in multihabitable systems, and the possibility of two planets sharing the biological burden could help the system traverse the inevitable rough times," Steffen said in a statement. The scientists concluded that multihabitable systems are among the few scenarios "where life — intelligent life in particular — could exist in two places at the same time and in the same system," Steffen said in a statement. "You can imagine that if civilizations did arise on both planets, they could communicate with each other for hundreds of years before they ever met face-to-face. It's certainly food for thought." However, "we have not seen a real system with aliens that are communicating with each other," Steffen emphasized. The scientists detailed their findings Tuesday (Dec. 1) at the Extreme Solar Systems III meeting in Waikoloa Beach, Hawaii. The findings have also been accepted for publication in the Astrophysical Journal. Follow Charles Q. Choi on Twitter @cqchoi. Follow us @Spacedotcom, Facebook and Google+. Original story posted on Space.com.